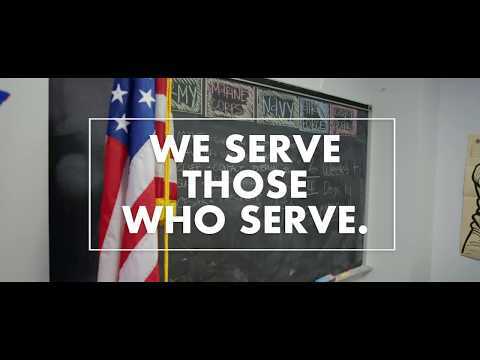 CCBC takes pride in serving those who have served by providing attention to the needs of our military-connected students, whether they are active duty, National Guard, Reservists, veterans, dependent spouses or children, or survivors. CCBC Veteran Services would like to thank you for your service! We're here to help you succeed in the classroom and beyond by connecting you to a variety of internal and external support services. CCBC has a VA Certifying Official on each of the three main campuses: Catonsville, Dundalk and Essex, to help you learn about your military educational benefits, scholarships, and other financial aid options. At CCBC you can build the skills you need to transition directly from your military occupation into a closely-related civilian career, earn an associate’s degree, or take the first step toward a bachelor’s degree and transfer with ease. Learn more about your military benefits and be matched with mentors every step of the way when you take our special Academic Development 101 course tailored for military-connected students. Use your military training and experience to jump ahead, spending less time and money on your degree. CCBC is here to help you meet your educational goals! CCBC’s yearly cost for a full-time student averages less than half the cost of a public four-year college, and our career training courses are way more affordable than those at proprietary training schools. It’s an unbeatable value, made even better by CCBC’s seamless transfer agreements with many colleges and universities. In fact, CCBC graduates are guaranteed admission* to any school in the University System of Maryland and many earn scholarships to their select transfer schools. With classes available close to your home, job, or wherever you need to be, CCBC makes it easy to fit college into your busy life. Our advisors can help you build a schedule that works for you. Choose from classes offered days, evenings and weekends online or at any of our three main campuses in Catonsville, Dundalk and Essex, and our extension centers in Owings Mills, Hunt Valley and Randallstown. CCBC also offers a flexible deployment policy for military members and their families, so if you deploy, you and your family are covered. You can make the most of your time at CCBC with the many flexible scheduling options available. Join us for a Thursday Tour or meet with staff for an in-depth look at CCBC during one of our Discover CCBC information sessions. Follow us on social media to find out what’s happening on campus, read what our students are saying, and see more of what CCBC has to offer. Get started at CCBC. It’s easy! Complete an Application for Admission. There’s no application fee. In addition to the general admission procedures, students applying for veterans benefits will need to take some additional steps.